The subscription plan is king but we see that more and more services offer on-demand pricing (eg: AWS). On-demand pricing system are more complicated to create and require providers to trust users that they will pay at the end of the month as it is costly to debit a credit card for micro payment. Crypto-currencies open the possibility for new pricing plan for on-demand services. 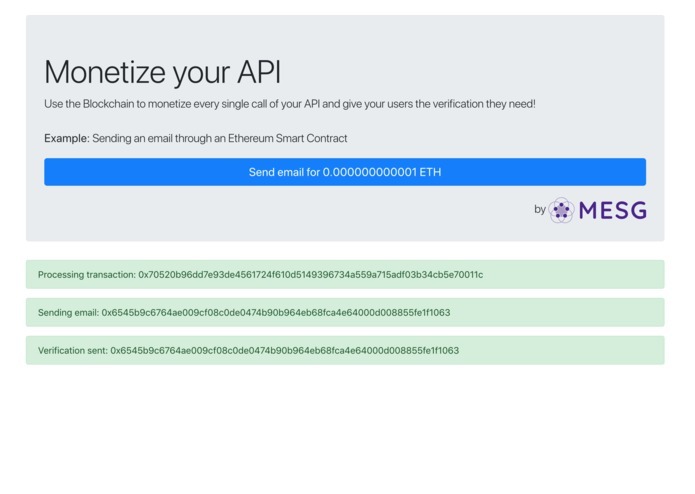 This Proof of Concept enables provider of web2 services to monetize their API by providing a web3 API through Smart Contract. We created a demo that consumes SendGrid API to send email in exchange of 0.000000000001 ETH. The smart contract is deployed on Kovan. We build it using MESG Framework to create the main application that connect and react on event from Ethereum, SendGrid, the encryption service.